More than 9,000 people on average are injured by fireworks every year. Though there are far fewer firework related deaths, they still occur almost every year. Many deaths and injuries could be avoided with knowledge about the dangers of fireworks as well as how to safely and appropriately use them. The number one safety rule is simply to leave fireworks to professionals. Many injuries and even deaths would not occur if people chose to let professional pyrotechnicians set off fireworks. However, if people do choose to light off their own fireworks, there are safety guidelines that should always be followed. Remember that there are always risks when lighting off your own fireworks. Below is a list of some very important safety guidelines to follow whenever using fireworks. 1. Leave fireworks to professionals. There are many wonderful firework displays and the option is to leave fireworks to professional pyrotechnicians. 2. Children Should Never Handle Fireworks. Never let children handle, play with or light any fireworks. Fireworks should only be handled by adults. 3. Adults should always supervise fireworks activities. Parents often don't realize that there are many injuries from sparklers to children. Sparklers burn at temperatures of about 2,000 degrees - hot enough to melt some metals. 4. Do Not Use Alcohol With Fireworks. Please do not consume alcohol when using fireworks. Fireworks must be used by individuals who act in a responsible manner and who are not impaired in any way. 5. Follow the Laws; Use Common Sense. Follow your local and state laws regarding the possession and use of fireworks. Do not use illegal explosives; do not alter any firework device; and do not make your own fireworks. Use common sense at all times in handling fireworks. 6. Only use fireworks as intended. Don't try to alter or combine them. 7. Use Fireworks on a Hard Surface. 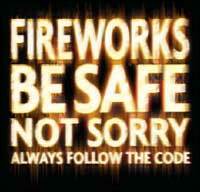 Use fireworks on a hard, flat and level surface, not on grass or gravel. 8. Use in a Clear, Open Area. Use fireworks in a clear, open area, making sure the area overhead is free from obstructions. Keep the audience a safe distance away from the shooting site. Watch out for dry grass, dry brush or any flammable items that could catch fire. Never shoot fireworks in metal or glass containers. 9. Keep Clear of the Fireworks. Never put your head or any part of your body over the top of any fireworks product at any time. Never look into a tube to check on the firework item. Never hold a lighted firework in your hand. 10. Use Care in Lighting the Fireworks. Always light fireworks products with an extended butane lighting device, a punk or a flare. Light the fuse only on the tip. Use a flashlight at night so you can see the fuse. Never use a lantern or other flame-producing device near fireworks for illumination. Light the fireworks product and get away quickly. 11. One at a Time. Once firework is in proper position, light only one firework item at a time and move away quickly. 12. Do Not Use Malfunctioning or “Dud” Items. Don’t persist with malfunctioning items. Never attempt to re-light, alter or fix any “dud” firework item. Wait 20 minutes and then soak it in a bucket of water. 13. Have Water Close By. Have a fire extinguisher, water supply, hose or bucket of water nearby. During any fireworks shoot there should always be someone assigned as the fireman, whose job it is to be alert and at the ready with a water source for emergencies. 14. Windy Conditions. Be cautious of lighting any fireworks during strong wind conditions. Light fireworks with prevailing wind blowing away from the spectators. If there is a wind shift during your shooting, you should stop or rearrange your shooting site to accommodate the wind shift. 15. Use Care in Handling Fireworks. Use care in handling fireworks and be careful not to drop them. Do not carry fireworks in your pocket. Never smoke when handling fireworks. Never shoot them off in metal or glass containers. 16. Never Use Fireworks as Toys or Weapons. Never use fireworks as weapons. Never aim, point or throw any fireworks at another person or at any property. 17. Storage of Fireworks. Store fireworks in a cool, dry place and dispose of fireworks properly. 18. Use Fireworks Outdoors. Use fireworks outdoors. Never use fireworks indoors. 19. Special Reloadable Rules. Never use a wet or damaged shell or launch tube. Insert shell all the way into the bottom of the tube, flat end down. Never force a shell into a tube. Use only one shell at a time. Wait at least 30 seconds between loading shells. Never ignite a shell outside of a launch tube. Never take the shell apart. Never relight a fuse that fails to ignite the device. After lighting the fuse, move a minimum of 20 feet from the launch tube. 20. Purchase Fireworks from Reliable Dealers. Purchase fireworks from reliable, licensed fireworks dealers. Do not use illegal explosives; do not attempt to make your own fireworks. 21. Safety Glasses. Safety glasses are recommended for individuals lighting fireworks and those individuals in close proximity to the fireworks. 22. Use Caution with Animals. Be careful with animals. Noise and lights of fireworks often frighten animals. 23. Do Not Transport Fireworks on Airplanes. Do not transport fireworks on airplanes; it is a violation of federal law. 24. Soak in Water Before Throwing Away. After fireworks fully complete their functioning, douse the spent device with plenty of water from a bucket or hose before discarding to prevent a trash fire. 25. Please remember fireworks safety every time you use fireworks!